1937 Reprint of of the Ludwig Instructor in the art of Snare Drumming. Written & compiled by Sanford Moeller. Picture of Sanford Moeller on the 1st page. Published by Ludwig. Front Cover has a young Bill Ludwig II ! NARD Drum Solos. Percussion for Musicians. Drum Books. Three-and-a-half hours of great material! 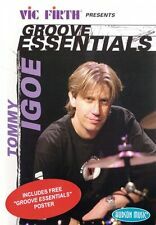 Groove Essentials is based on the definitive collection of contemporary rock, jazz, R and B, funk, and world/ethnic drumming styles contained in the poster of the same name, developed by world-class drummer, teacher and author Tommy Igoe and Vic Firth drum sticks. On this DVD, Tommy demonstrates 47 of today's most popular drum patterns, including a performance of each with a rhythm track played by some of New York's top players. This unique feature lets the student hear what each groove sounds and feels like with real music played by live musicians. 4 x Drum Tuition Books. Book 2 - Pop n Rock Vol 1 no CD. Inventory#: 000320608. 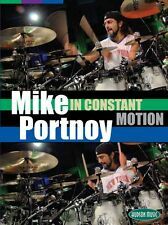 Mike Portnoy in Constant Motion. Artist: Mike Portnoy. In Constant Motion features over seven hours of instruction as well as live and studio performances of virtually all the music Mike's been involved with since his award-winning Liquid Drum Theater video. DVD's are in great condition. Advance your creativity and command of the drum set. Phrasing will help you expand your vocabulary by using standard rudiments and exciting rhythmic concepts, making your playing more conversational, dynamic, and focused. First, you'll learn a core set of phrases that are the basis for all the exercises. Then, each of the 50 lessons applies rudiments and innovative stickings to the phrases to explode the rhythmic potential of standard practice routines. This process will give you a comprehensive drum set vocabulary that you can bring to all groove styles. 52 minutes of video demonstration and audio play-along tracks are accessible online for download or streaming, using the unique code inside this book. The Art of Bop Drumming - includes CD with the book. 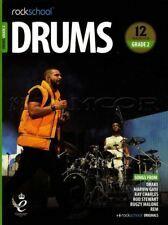 Basic Drum Book. Drum Books. Drawing from decades of experience as percussionist with the New York Philharmonic and as a world-renowned educator, Morris Arnie Lang explains all the facets of wisdom gained in his studies with Billy Gladstone. Topics include principles of the Gladstone technique, parts of the stroke, and body mechanics. An approach to the rudiments is covered in detail, as well as various other topics including accents, matched and traditional grip, and a segment on applying the Gladstone technique to the drumset. In addition, Lang presents a look at how he has carried on the tradition of manufacturing the legendary Gladstone drums with his own company, and discusses many aspects of his career, including working with the New York Philharmonic, auditions, working with a conductor, knowledge of styles and more. 2 hours. Transcriptions from Dixieland Drumming 1937. Best regards, MW. 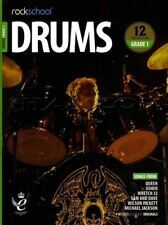 This book is 334 pages and includes Tommy’s lessons, biographical information, music history and more. Finger drumming 189-191. Percussion technique 1937. Schinstine and Hoey's Intermediate Drum Book is an in-depth look into the snare drum. Topics include basic technique, musicality and expression. Inventory#: 000320305. Mike Portnoy Liquid Drum Theater. Artist: Mike Portnoy. Disc Two focuses on the music of Dream Theater. Recycled Percussion drummer Justin Spencer executes and explains the fundamental stretching and workout routines specific to improving your drumming. He isolates muscle groups that fatigue easily for drummers and demonstrates techniques for increasing stamina. Spencer also discusses his own experience with injury, the impact on his drumming career and the strategies that enabled him to recover with a stronger level of performance than he had prior to his injury. Fitness for Drummers is designed to illustrate basic workouts with simple everyday equipment that are the core elements to improving drumming speed, control and endurance. 31 minutes. John (Jack) S. Pratt, U.S. Army retired, is one of America's greatest rudimentalists and percussion composers. His published works have become standard rudimental curriculum for more than half a century. This DVD will reinvigorate your study of traditional ancient rudimental drumming and provide material for your practice, instruction, music library and drumming pleasure. It features: classic Pratt solos (The Sons of Liberty; The All-American Emblem; The Little Toy Drum) - new Pratt solos (Interstatesmen A.B.C. A great collection of 15 Beatles songs arranged for vibraphone, including: And I Love Her - Blackbird - Day Tripper - Eleanor Rigby - Here Comes the Sun - Hey Jude - I Feel Fine - I'll Follow the Sun - In My Life - Lady Madonna - Let It Be - Michelle - Norwegian Wood (This Bird Has Flown) - Strawberry Fields Forever - Yesterday. Video available at - youtu.be/zbYgZ7d68ko. The Stick Bag Book of Latin Rhythm and Percussion is the ultimate resource for drummers and musicians. 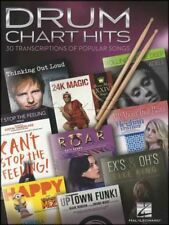 It features the most influential styles, rhythms, and techniques - all in one handy, easy-to-use reference guide. Whether you are a percussionist, producer, arranger, or songwriter, a strong knowledge of these rhythms will add to your overall versatility as a drummer and musician. The Stick Bag Book of Latin Rhythm and Percussion covers Baiao, Danzon, Cascara, Guaguanco, Kiriba, Merengue, Rumba, Songo, Vallenato, and much more! Also includes a tuning and maintenance section!. Inventory#: 000200804. Artist: Charlie Watts. Condition: New - Unused - Unopened. Series: Book. Pages: 216. Inventory#: 000400139. Music Minus One for Drums. The most exciting titles in music built around the drum chair. Jim Chapin and Roger Pemberton have arranged these for an all-star aggregation including such players as Clark Terry, Hal McKusick, Hank Jones, George Duvivier, Harold Lieberman, Bob Wilber, Sonny Russo and YOU. Inventory#: 000001562. Rockin' Poppin' Snare Drum Vol. The first in a series of three snare drum instructional books from Bart Robley, this book is perfect for beginners of any age. A CD is included so you can listen while you practice, eliminating any guess work. Learning to play the drums continues to be easier than ever before, with the second book from the celebrated Absolute Beginners series. 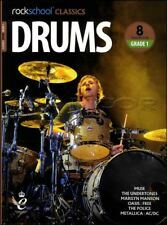 With this superb book you get a comprehensive drum course featuring step-by-step pictures which take you from the first day exercises to playing along with backing tracks. The book contains practical advice and tips covering everything you need to know about setting up, playing and maintenance, and the CD contains audio versions of the exercises in addition to full-length accompaniment tracks for you to play along with. Inventory#: 006620163. Contemporary Jazz Styles for Drums. The Collective: Contemporary Styles Series. Publisher: The Collective. ISBN: 9780825862694. Over 600 examples demonstrated on an MP3 CD are included in this book/CD pack. The book covers the same topics as the Groove Alchemy DVD (HL00320974) in an even more comprehensive fashion, containing transcriptions of all of the historical grooves, plus all of Stanton's creative expansions and applications of them. The package also contains four play-along tracks taken directly from Stanton's Groove Alchemy CD. These are some of the same songs performed on the DVD, so, using both products together, the student can watch and listen to Stanton perform, and then try the songs for themselves. Inventory#: 050485239. The author starts from this happy pre-supposition: Everyone can play the djembe! One musician stated, Beating the drum with bare hands is not only playing the drum. It is truly touching the sound which is intangible. Hello everybody interested! I have some very special drums here. 3 duns, made by Moperc. If you don’t know them, they’re perhaps the best drum maker out there, overall. Extremely solid, tunable drums. These guys are warm, but as loud as you get. Truly great drums. 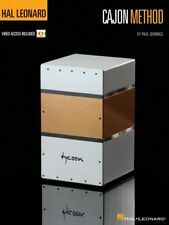 Also, Moperc doesn’t make these anymore, but there’s a copy of their price list online. After shipping, they’d set you back close to 2k, and they’re worth every penny. The heads are top notch, and would probably set you back almost the cost of the drums. All original, with some scuffing from use, but structurally 100% sound. They sound amazing. Hard to get, I’m offering them here. Thanks!!! I’m offering free shipping on these drums. Inventory#: 000209864. Designed for anyone just learning to play the drumset, this comprehensive and easy-to-use beginner's guide is based on years of teaching drum students of all ages. Publisher: Hal Leonard. Inventory#: 000690621. Series: Drum Recorded Versions. Condition: New - Unused - Unopened. Best of blink-182. The book is divided into three sections, each representing a different jazz style: rock, swing, and Latin. STANDARD OF EXCELLENCE. Inventory#: 000320421. Artist: Horacio Hernandez. Condition: New - Unused - Unopened. Publisher: Hudson Music. Inventory#: 000281632. The first ever instructional book on how to play Trap style beats - Trap Style Drumming for the Acoustic and Hybrid Drum Set - written by Greg Torch Sgrulloni! Series: Percussion. Inventory#: 050448012. Learn how to play and practice the classic rhythms of the Afro-Cuban tradition with Berklee professor Ricardo Monzon. You'll play along as he starts slowly with the basic patterns, then increases the tempo with a number of variations. Matching folio to Metallica's second album, including: Creeping Death - Fade To Black - and more. Inventory#: 000695328. Afro-Cuban Coordination for Drumset. The audio files include PLAYBACK , a multi-functional audio player that allows you to slow down audio without changing pitch, set loop points, change keys, and pan left or right. Inventory#: 000841355. - Teaches the basics of swing style in a step-by-step approach, using well-known songs. - Jazz history and people. Condition: New - Unused - Unopened. Inventory#: 000321300. Advanced Independence and Polyrhythms. Ultimate Drum Lessons Series. Format: DVD. Authorized Dealer: Musical Progressions. Inventory#: 000175795. First 50 Songs You Should Play on Drums. Series: Drum Book. Authorized Dealer: Musical Progressions. Condition: New - Unused - Unopened. Inventory#: 000317126. Primary Handbook for Mallets. Format: Softcover with Online Audio Access. Condition: New - Unused - Unopened. Learn to play djembe! This hands-on workshop will help you produce a good sound, play with healthy technique, and learn the essential concepts, sounds, and rhythms of West African djembe drumming. Extensive play-along online videos will help you practice every technique in the context of a traditional African djembe ensemble. Includes classic solos and performances, rare video from the vault, bonus footage from the Warner Brother's library, exclusive photo gallery and much more. Also featuring John Scofield, Gary Grainger & Jim Beard. This book is in great condition. Only has 1 CD (See Picture) No torn pages that i could find. Much of the repertoire contained in this book will be of sufficient standard to be used across several examination standards. In Your Hands by D2 Percussion. Essential Elements 2000 Percussion Book 2- Includes Keyboard Perc.- Brand New!